October 15, 2015 – NASA’s James Webb Pathfinder recently completed its first super-cold optical test, which resulted in many first-of-a-kind demonstrations. The Pathfinder is a non-flight replica of the Webb telescope’s center section backplane, or “backbone,” that includes mirrors, and is used in testing to ensure that tests on the real Webb telescope later goes safely and according to plan. The flight backplane comes in three segments, a center section and two wing-like parts, all of which will support large hexagonal mirrors on the Webb telescope. The pathfinder only consists of the center part of the backplane. However, during the test, it held two full size spare primary mirror segments and a full size spare secondary mirror to demonstrate the ability to optically test and align the telescope at the planned operating temperatures of -400 degrees Fahrenheit (-240 Celsius). The first cryogenic optical testing of the Pathfinder was successfully completed in Chamber A at NASA’s Johnson Space Center in Houston, Texas. Chamber A was originally used to test the Apollo capsule. 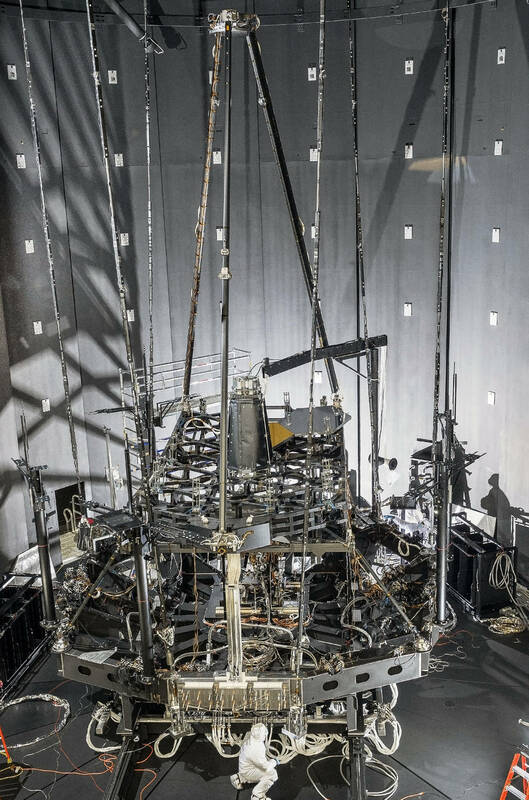 This test demonstrated new helium and nitrogen cooling systems installed for the Webb telescope testing which allowed the Pathfinder to achieve those frigid temperature that will simulate operating temperatures we will have at the L2 Lagrange point. The cooling system is installed in the chamber. There is a vacuum chamber with a nitrogen shroud inside of it and then a helium shroud inside of the helium shroud. The Pathfinder is then inside the Helium shroud. “The most significant breakthrough was the first-ever cryogenic optical alignment and testing of multiple primary mirror segments in a process known as ‘phasing,'” said Lee Feinberg, Webb telescope Optical Telescope Element Manager at NASA Goddard. “During the demonstration, mirrors that were initially misaligned by millimeters were aligned to each other using actuators operating at -400F to better than one-one-thousandth diameter of a human hair (or a fraction of a wavelength of light) such that the two primary mirror segments were optically equivalent to a single monolithic mirror,” Feinberg said. The second “first” involved the vertical orientation of the testing of the mirrors. It marked the first time a lightweight cryogenic mirror of this type had been tested in a second gravity orientation. “To understand a second gravity orientation, think of a cup,” Feinberg said. “When the cup is face up so you can pour water in it, it is vertical to gravity. Now put the cup on its side and it is horizontal to gravity. Mirrors are like cups in this explanation.” That allowed for successful cross-checking of the predicted zero-gravity performance of the mirrors. “In another major achievement, four large super cold windmills carrying steerable cameras were able to measure the alignment of all of the mirrors and structure to better than one-tenth of a millimeter using a process called photogrammetry,” Feinberg said. Photogrammetry is a technique that takes images from multiple to simulate operating temperatures orientations, combines those images, and then using triangulation algorithms to determine distances between objects in those scenes. The phasing demonstration used a new metrology device developed for NASA to test segmented telescopes by 4D Technologies Corporation called a multi-wavelength interferometer and used a reflective null lens designed and built by Harris Corporation. After this test completed, the flight Aft Optics System, which includes the Tertiary Mirror and Fine Steering Mirror, was installed on the Pathfinder to prepare for a second test. The full Pathfinder was then outfitted with special fiber-fed infrared optical sources that simulate star images. Those star images, or infrared sources, along with a specially instrumented infrared detector will be used during the second test to perform end-to-end testing of the full Pathfinder telescope system and ensure they function as simulated stars. After that second test is complete late in 2015, all optical test systems will have been checked out. A third and final precursor test called “Thermal Pathfinder” will follow in 2016 that will fully test all the test equipment needed to simulate the temperature environment of space. Once this is complete, all test equipment and procedures needed to test the actual full flight telescope and the Integrated Science Instrument Module or ISIM assembled as a unit in early 2017 will be checked-out and ready. The James Webb Space Telescope is the scientific successor to NASA’s Hubble Space Telescope. It will be the most powerful space telescope ever built. Webb is an international project led by NASA with its partners, the European Space Agency and the Canadian Space Agency. Ball Aerospace is responsible for the the observatory’s primary mirror, as well as the secondary mirror, tertiary mirror, and fine-steering mirror.